The newest generation of LTO Ultrium tape drives (LTO-6) are now available, offering a storage capacity of up to 6.25 TB (assuming 2.5:1 compression) – and transfer rates of up to 400 MB per second (assuming 2.5:1 compression). LTO 6 continues to support partitioning functionality (like LTFS ) enabling capabilities that can help enhance file control and space management, addressing the growing needs of marketplace segments such as Rich Media. 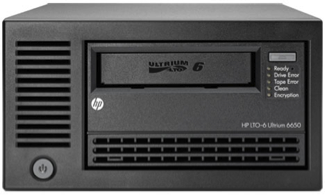 LTO 6 Tape Drives from CPU Inc.